When it comes to man caves, Blue Collar Comedy star Dan Whitney, aka “Larry the Cable Guy,” is the master. In building his custom, 3-building compound, he made sure there was a space dedicated to all the stereotypical enjoyments a guy could possibly want in one place. 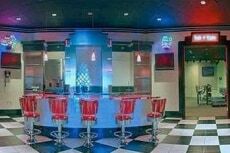 His manly oasis includes a poker table, pool table, bar, flat-screen TV, video machine, bar signs, and turf-like carpet as the finishing touch. 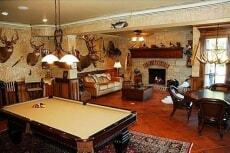 Whitney’s impressive man-cave is up for sale along with the rest of the 20-acre property. Whitney listed his home in Nov. 2010 with an asking price of $1,550,000. See more Stanford real estate here. 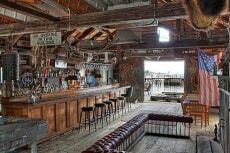 The previous owners of this Nautilus Island estate went to the extremes of man-cave creation converting the boat house into a old-time, tavern-style escape with a full kitchen, bar, stone fireplace, pool table, and more than enough room for all your friends to enjoy the big game. The 37-acre property also consists of a 6-bedroom main house, outdoor swimming pool, tennis court, farmhouse, guest cottage, and barn. See more Brooksville real estate here. 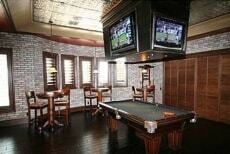 Channeling the atmosphere of a classic sports bar, this man cave has tall bar tables and chairs, a pool table, dark hardwood floors, and — in a nod to the massive scoreboards found in many sports arenas — there is a drop-down bank of four TVs mounted from the ceiling, which offers a 360-degree view of the game. Featured on MTV’s Cribs, this home has 7 bedrooms, 10 bathrooms, 2 theater rooms, arcade/dance club, bowling alley, pool, fitness room, library, elevator, 6-car garage, and a 55-ft tall atrium. See more Washington real estate here. If classic and contemporary is more your game-day style, this seaside mansion has the ideal man cave. Three, mounted flat-screen TVs, and a massive, mahogany accented, C-shaped couch ensures that every guest will have a great view of the game, no matter where they’re sitting. Halftime can be spent strolling around the 8,400-square ft of living space, taking a dip in the infinity pool, or grabbing a few more bottles of wine from the glass-encased wine cellar. See more Laguna Beach real estate here. Noted as “one of the most significant hunting and equestrian estates,” Tudor Farms consists of 6,250 acres and an 11-bedroom, 10.5-bathroom, lodge-style home. Super Bowl Sunday could require even the ultimate huntsman to take a break from the outdoors and, luckily, Tudor Farms’ residents don’t have to go far. 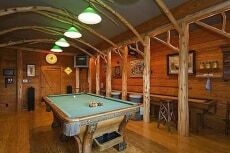 Among the 14,000 square feet of living space is a cabin-like man cave with log columns, corner-mounted TV, pool table and bar. See Cambridge home values here. Located in the northern part of Atlanta, this humongous estate doesn’t just come with a man cave, but an array of amenities reminiscent of a family fun center. Imagine this: the football game streaming live in the 21-seat theater (complete with ticket booths and concession stands), finger food and snacks galore in the diner-style kitchen, and a two-lane bowling alley, arcade room with pool table, air hockey, and pinball just around the corner. The property is currently listed for $18 million — down more than 50 percent from its original 2009 list price of $45 million. A man cave with a hunter’s twist, this Missouri mansion is listed as “country club living at its finest.” When it comes down to game day, however, the sports fans of the family will leave the lakeside pool and congregate in the antler-themed man cave complete with wood-burning fireplace, pool table, poker table, and full wet bar. 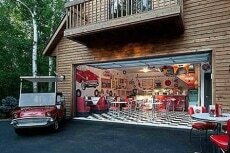 Have a sock-hop themed Super Bowl party in this garage-turned-50s-diner. Outfitted with red leather booths, a checkered floor, and vinyl records on the wall, this man cave has lots of seating and a kitchen perfect for dishing out finger food. Pre- and post-game activities can also be found on the property. Built as a private family retreat, the 30-acre compound has an indoor pool, hot tub, theater and stage, billiards room, and library. According to the listing information, this 4-parcel, 245-acre property is “one of the last remaining original ranches in the Aspen area.” Luckily, the beautiful forest scenery doesn’t have to be missed when it’s time for the game. 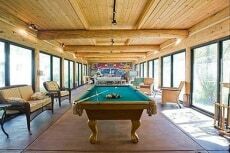 Walls of glass surround the spacious recreation room that contains all the must-have man-cave amenities such as a pool table, Foosball table, flat-screen TV and tons of seating. Forget about watching the Super Bowl on a flat-screen TV in a crowded New York City pub. Just 45 minutes from the hustle and bustle of the Big Apple is a 21,000 square ft, Georgian Manor that not only has an 8-bedroom main house, gatehouse, guest house, and caretaker’s house, but a giant rec room with a movie theater-sized big screen that will have you feeling like you’re sitting at the game. An L-shaped couch and large window seat ensure all football fans will have a seat. Not to mention, there’s a pool table at the back of the room for halftime entertainment. ©2006-2012 Zillow.com. All rights reserved.